Gary Numan is perhaps best known for his song “Cars” and this spectacular rendition of “Down in the Park,” from the 1982 documentary Urgh! A Music War. Even before his ‘80s solo career, he was adding a bit of gothic glamour to British punk with Tubeway Army. More recently, he’s been the opening act for Nine Inch Nails, and he’s releasing a new album, Splinter, in October. But Numan’s just a normal guy who loves his family and takes them on fun summer vacations. Proof is on his official Twitter account, where he has been live-tweeting his extensive drive through the wilds of California in an RV with his wife, Gemma, and three young daughters, Raven, Persia, and Echo. There’s also a slobbering dog named Wilbur. His tweet-narrative is certainly entertaining and often poetic, filled with all the highs and lows of a summer vacation. 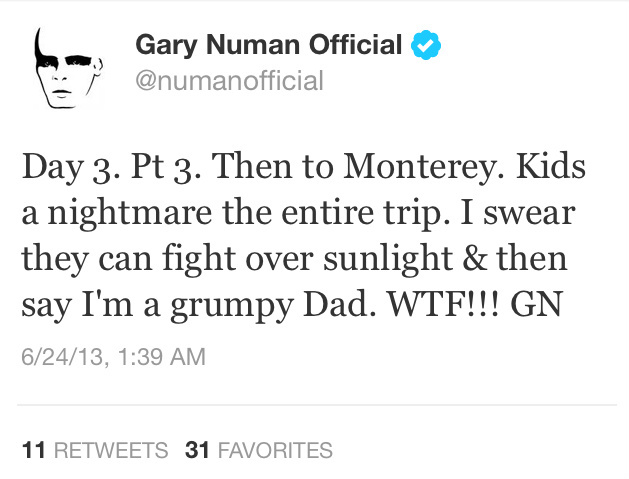 via The Daily Dot – Gary Numan is live-tweeting his family’s summer vacation.